The famous Merlion sitting at the Singapore River mouth since 2002. It was located on another side of the river further to the east of the present site. On 6 Mar 09 it suffered the embarrassing strike of a lightning bolt and its left ear fell to the ground. It has since been made good and is still drawing millions of tourists to take pictures for keepsake. Across the road behind the Merlion, to its right but not in the picture, is the Fullerton Hotel. 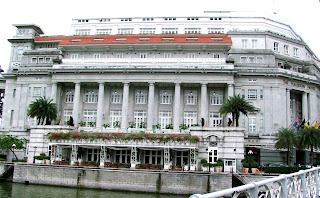 This old but majestic building of the colonial era stood imposingly at the original river mouth once. For many years the Fullerton Building was the Central Post Office as well as the Inland Revenue Office. Now it is a 5 star hotel and in a class of its own. Its building structure looks like it is going to be there for another thousand years. I am now standing at the Cavenagh Bridge looking at the Fullerton, at 6pm in the evening. This bridge was named after Colonel Orfeur Cavenagh, the last Governor of the Straits Settlement. And this is where our journey up the Singapore River will begin.